Listed below are the most frequently asked questions about our green transition. 1. What policies are in place to monitor and manage your supply chain regarding environmental issues? • Arizona Catering uses, whenever possible, certified sustainable harvested fish, and requests meats and seafood produced with reduced amounts of antibiotics. • Arizona Catering promotes vegetarian options to clients by offering over 50 vegetarian entrée choices. 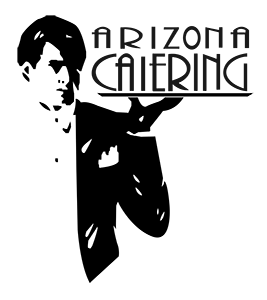 • Arizona Catering uses local and state produced products whenever possible. 2. What type of packaging / shipping materials do you use? 3. Does your company have a Green Transportation Plan for you operation? If so, please explain. • Arizona Catering encourages all employees to carpool to both the office and off site events. Employees are scheduled to arrive and leave at the same time specifically fir this reason. At this time, the cost to change to environmentally friendly vehicles is not within our budget, but it has been planned that future vehicles purchased will ONLY be clean vehicles. 4. What does your company do to minimize the environmental costs associated with shipping? • Arizona Catering attempts to deliver multiple events with one van by combining orders in similar zip codes eliminating the need to use more than one vehicle for deliveries. • Arizona Catering is also a “minimal” paper waste office. All contracts and proposals are sent to clients via email eliminating the paper waste. Clients who do not have access to email are mailed paper, but this is avoided whenever possible. 5. Does your company have an environmental policy statement? • Arizona Catering in consideration of future generations has begun and will continue to improve our methods of food production, presentation, service and waste removal, not limited to just basic recycling. As new environmentally friendly products and vehicles are introduced in the market, we will investigate and replace existing vehicles and equipment with those items as the needs present themselves. Furthermore, Arizona Catering’s management will take on the responsibility of educating the employees and clients about environmentally friendly programs and how they benefit us all. 6. Has your company ever been cited for non-compliance of an environmental or safety issue? 7. What programs do you have in place, or planned for promoting resource efficiency? • With the environment in mind, Arizona Catering stocks reusable buffet décor, serving pieces and serving equipment. Recycling bins are used at all events. • To conserve energy, we turn kitchen equipment on as needed and never all at once. • Soft water units have been installed to prevent mineral deposits that require harsh chemicals to remove. • Routine inspections of kitchen equipment, refrigerators and HVAC equipment as part of our preventative maintenance program. This includes cleaning of air conditioning coils, air filter replacement, thermostat calibration and lubrication of exhaust and supply from bearings. • Shop locally to reduce transportation pollution. • Offer recyclable products to clients made from corn, sugar cane and bamboo. 8. Does your company have web-based materials available documenting your “Green” initiatives? • Arizona Catering has not updated our website in six years. We have forecasted our website to be upgraded by the end of 2008 and will include our recent Green initiatives and our effort to promote only sustainable products. 9. If you are providing a product, does the manufacturer of the product that you are bidding/proposing have an environmental policy statement? • The vendors supply us with sustainable product information and recyclable information on disposables. 10. If you are providing a product, has the manufacturer of the product that you are bidding/proposing ever been cited for non-compliance of an environmental or safety issue? • Not that we are aware of. 11. Has an environmental life-cycle analysis of the product that you are bidding/proposing been conducted by a certified testing organization, such as Green Seal? • Since our main product is food service and our goal is to use only local and sustainable products, we have never requested certified testing as long as the products fulfill either or both of these requirements.